Unity Government’s Chief Executive, Dr. Abdullah Abdullah has refused to attend the Consultative Loya Jirga, scheduled to be held on April 29th to discuss ways and means for return of peace and reconciliation with Taliban resistance force, saying that not only him but also his electoral team would not attend the jirga. This announcement on the part of Dr. Abdullah has not only causes wide range unrest amongst the war affected people but could be considered first ever revolt against the Loya Jirga, which had always helped the Afghans of resolving own internal disputes but also averting plunging of the country into crises, even ensuring its sovereignty and solidarity at the time of aggression from abroad. No one can deny the fact that President Ghani’s decision of approaching the Loya Jirga is too much delay as it was scheduled or demanded in 2017 not only for overlooking the peace process but also for addressing anomalies in the Constitution. In fact, President Ghani has never made an attempt to take the nation into confidence regarding important issues including Durand Line affairs with Pakistan. Such failure on the part of President Ashraf Ghani now resulted irreparable losses to Afghanistan and its people. Dr. Abdullah who is in contest for the top important Presidential office for third time is not alone but he enjoys support and association of powerful figures such Karim Khalili and Abdul Rashid Dostum as his backers. Justifying his decision, Abdullah claims, “we in the Stability and Convergence Team were not consulted to call the jirga, neither in level of political parties and figures nor in government. We see no justifiable reasons for the jirga either. Bashir Ahmad Tah Yench, an ally of Abdullah in the upcoming presidential elections accused President Ashraf Ghani of misusing the Loya Jirga for his personal campaign in the elections. “This is a matter of concern for us that unfortunately President Ghani makes efforts to use the Jirga as his campaign for election. 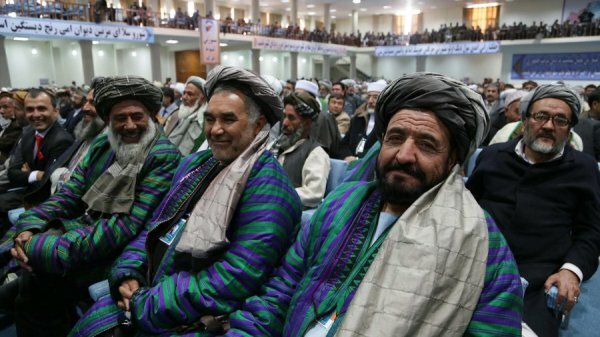 His claims that he was authorized by the people to call the Jirga, will challenge the peace efforts,” said Tah Yench. So far no any reaction was made by President Ghani or his aides. Ghani’s Spokesman, Shah Hossain Mortazawi said that government would later comment in this regard. The Political analysts interpret Abdullah’s stance as the climax of differences in the leadership of the national unity government. “This stance is a reaction from an electoral team and besides that, is an indicator of distrust space and differences that has been existed in the unity government and is now at its climax,” said Nasrollah Stanekzai, political sciences professor at Kabul University. But rifts and divisions amongst the ranks of so-called Unity is not new for the Afghans and rest of the world as well. Since installation of unity government in last half of 2014, President Ghani and Abdullah’s team are at irons to each other’s. Even both of them have made at surprise UN like bodies when they insisted on attending and addressing its General assembly simultaneously. Such rifts and divisions could be assumed nothing else but bad luck of the country and its people who are ahead with turmoil due to strange-pulling for powers and perks amongst its leaders.